About the Book: A. J. Fikry is the curmudgeonly owner of a small bookstore on Alice Island. Since his wife died, A. J. has been isolating himself from everyone on the island, his bookstore isn't making much money, and now his prized book of rare Poe poems has been stolen. But things take an unexpected turn when a special package arrives at the bookstore. It's a mysterious package that gives A. J. a new outlook and second chances. GreenBeanTeenQueen Says: Every once in awhile a book comes along that is so special and delightful and wonderful that you just want to hold it close and sigh with happiness as you read it. And The Storied Life of A.J. Fikry is one of those books for me-and I think it will be that type of special book for book lovers, avid readers, librarians, and storytellers. At the center of the novel is books-how they can change our lives, how they connect people who might not otherwise come together, and how sharing them can give us insight to those around us. 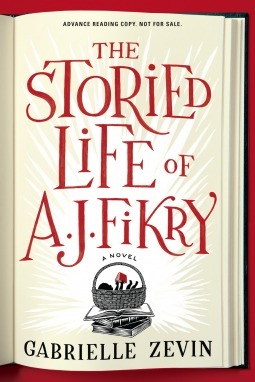 I read The Storied Life of A. J. Fikry during middle of the night feedings with my newborn son. You know you've found a very special and wonderful book when you find yourself wanting to stay up a little bit more just so you can read a few more pages-even when you're very sleep deprived! I was already a fan of Gabrielle Zevin before this novel, but this book solidified my fandom even more. She's not just a writer, but a reader and that comes across in her understanding of the book world and how she writes about A. J. and those around him. This book made me wish I could own an island bookstore someday-and made me glad that I work with books and that part of my job as a librarian is helping people discover books to read. It's hard to talk about this book without saying too much about the plot because it's best to leave the plot as a surprise. I think it makes the story more of a treat for the reader if you don't know much about the story other than it's an utter delight. If you are a book lover, this book is for you. The inner workings of a bookstore will resonate with those who work in the book world on a daily basis and the commentary of how much loving books and reading can impact your life will be sure to have readers nodding their heads in agreement. The way the characters talk about reading, books, and life is spot on. This book gave me one of my new favorite questions to ponder-"if you had to eat at a restaurant themed after a work of fiction, what would you choose?" A delightful book that you should pick up immediately-but make sure you've cleared your day first because you want to stop reading. This sounds like a wonderful book. I had no idea Zevin had written anything besides her dystopian YA books. Thanks for the head's up -- I'm definitely going to request this one from the library! I'm very excited to read this book ever since I read the book's blurb. I'm so glad you enjoyed it and I look forward to reading it. Thanks for mentioning this book -- it's going on my TBR list! Just finished this book over the weekend. Excellent read! Glad to see it getting buzz.